Last week, San Francisco Chronicle columnists Matier & Ross reported that the owners of a house at the corner of Lombard and Jones Streets had recently completed a major remodel to the exterior of their home. Normally I wouldn't take notice of changes made to a private residence, but here the building in question has historic significance to cinephiles. It's 900 Lombard, the residence of Jimmy Stewart's character Scottie in Alfred Hitchcock's masterpiece Vertigo. Though the indoor scenes in Scottie's apartment were shot at a Hollywood studio, the view from his window, with the phallic Coit Tower looming over the landscape, remains essentially unchanged from when it was synced, through the magic of 1958 Hollywood technology, to these crucial interior shots. But the facade, which features in two just-as-crucial scenes, now is no longer recognizable as a Vertigo location from the street. One would think the owners of the house, who apparently own a business dependent on the tourist trade, would want to honor the historic nature of their home. Surely they were aware of the movie connection when they moved in 23 years ago, as by this point it was a well-known fact, documented in Michael Oliver-Goodwin and Lynda Myles's 1982 San Francisco magazine article (reprinted in this book). But, according to Matier & Ross, they made the change precisely because they were getting too much attention from Vertigo location hunters. 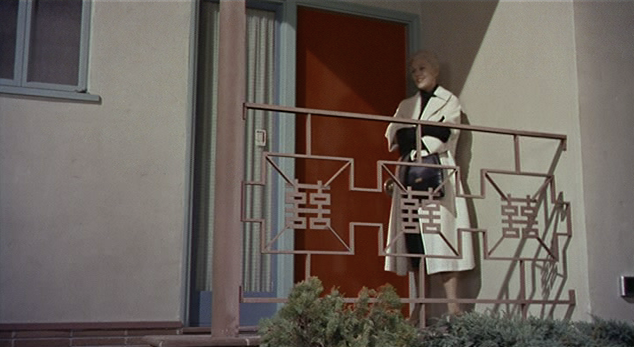 It seems rather preposterous to me that there would be many cinephiles ringing the doorbell of a private residence, as if expecting a red-robed Kim Novak to answer the door. But what do I know. Maybe there are a lot more unmannered Hitchcock diehards out there than I realized. I do know that I've personally avoided mentioning the addresses of private residences when writing abut film locations (including Vertigo's) on this blog and elsewhere- until now. And when I've visited 900 Lombard I've been careful to respect the privacy of the owners by keeping my voice down and avoiding getting too close to the property, much less trespass. Reading through the many reader comments on the Matier & Ross article at sfgate.com is depressing to someone like me. The general gist of most of them is: "it's only a movie", "private property rights trump all other concerns" and "film buffs are a pathetic and slovenly lot", although there are a few welcome counter-examples. I don't know. Maybe I'm sensitive because I recently wrote an essay about 1940s & 50s San Francisco location filmmaking for a book expected to be published next year (as part of this series.) Or maybe I've just seen too many Hitchcock movies and have gone overly suspicious, but I feel like there's something else happening here, and the Vertigo connection is more of an excuse than a reason for the remodeling. Over the Thanksgiving weekend, I made an excursion to Jones and Lombard to take a look at the changes up close. I went with local filmmaker Sean Gillane, who earlier this month saw his ambitious narrative feature directing debut CXL get its world premiere screening at the SF Film Society's Cinema By The Bay festival. Another world premiere at this festival was Alejandro Adams's fourth feature Amity, which for me is his best picture since his own feature debut Around The Bay. Take that endorsement as you will, as in the past few years I've become friends with Adams, and he and his girlfriend Sara Vizcarrondo (another friend) once invited me to participate in an on-camera discussion of another of my favorite filmmakers (Apichatpong Weerasethakul) on their show "Look Of The Week". Likewise, Gillane (who re-used more than one Vertigo location for his CXL) suggested he film me discussing Vertigo and its role in the psycho-geography of San Francisco at the site, and so he did. I don't know what the fate of this footage will be once it's been edited, but I trust it's in good hands, and will certainly keep Hell On Frisco Bay readers posted. San Francisco, of course, is nothing but another character in the film. [screenwriter] Samuel Taylor wrote to me agreeing that Hitchcock liked the town but only knew ‘what he saw from hotels or restaurants or out of the limo window’. He was ‘what you might call a seden­tary person’. But he still decided to use the Dolores Mission and, strangely, to make the house on Lombard Street Scottie’s home ‘because of the red door’. If Marker and the red door no longer exist, Vertigo and Sans Soleil still do. 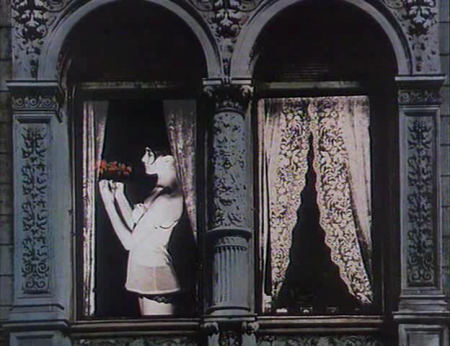 The former film will appear in 35mm at the Pacific Film Archive March 13th as part of the Spring semester's Film 50 afternoon screening and lecture series devoted to "The Cinematic City". 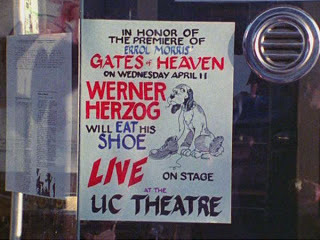 The latter film recently played the same venue as part of a compact Chris Marker tribute which concludes tonight. Chris came to the Bay Area fairly often in the '70s and '80s, when I was at PFA ('72-'79) and Zoetrope ('80 to the present), sometimes on stopovers to Japan, and sometimes for the two major films that had sequences he shot in Northern California -- Sans Soleil and The Owl's Legacy. I helped him on both. He also did a little second-unit work on Rumble Fish for Zoetrope for a brief moment. He always stayed in Berkeley, sometimes at my place and sometimes at the Hotel Shattuck. I drove him to SF many times in the '70s. He was fascinated by the Emeryville Mudflats and one day asked me if anyone had made a film on the ever-changing gallery of objects on display there. I said I did not think there was a film, and he said "let's make one". 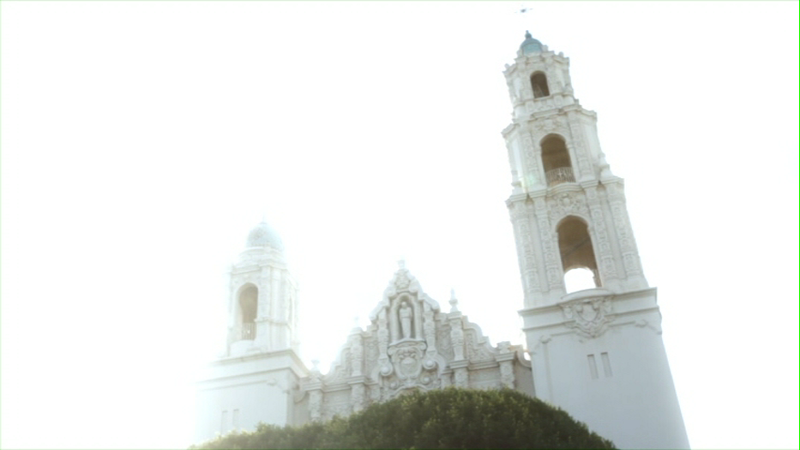 So I recruited John and Frank from Zoetrope, and some equipment, and in no time we were shooting there. He was very generous in putting in the credits "Filmed by Chris Marker, John Chapman, and Frank Simeone." 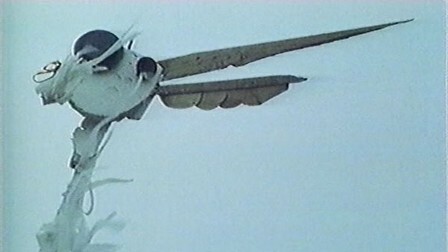 But in fact this is a film by Chris Marker in the authorial sense. He gave me a Credit for SPECIAL EFFECTS.... don't ask to explain what for? He called his producer for many films --Anatole Dauman-- in Paris. Anatole agreed to cover all the costs of the film. Anatole wanted to pay me for my work on the film. I refused to take any money but I said it would be great if I could get a 35mm print as a kind of compensation. He said fine as he did on Sans Soleil as well. I have a 35mm print of Sans Soleil on deposit at PFA too. I worked on films with great film-makers (Godard, Agnes Varda, Francis Coppola, etc) and with many more thru my work at PFA, Telluride, San Francisco Film Festival and so on.... Chris is/was the most impressive of them all -- a genius as a writer, photographer, film-maker, collage artist, sound designer, historian, poet...and a great human being. Tom Luddy's print of Junkopia will screen at the PFA again tonight on a program with a chapter from Marker's 13-part The Owl's Legacy, and with two Marker works made well before his association with Luddy: Les Astronautes (pictured above) and La Jetée. Also screening is Emiko Omori's new documentary To Chris Marker, an Unsent Letter, which Luddy appears in along with other Frisco Bay-connected film personalities like David Thomson, Peter Scarlet, Erika Marcus and David and Janet Peoples. Be there! 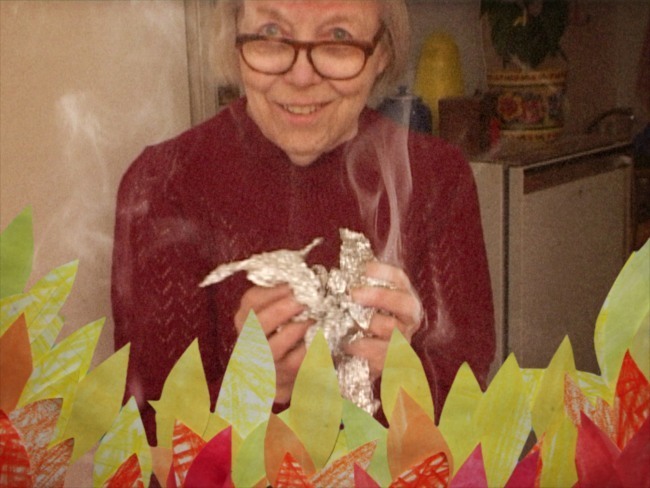 The film that most drives me to queue up at this year's San Francisco Documentary Film Festival running bi-bay from November 8th-21st, is Grandma Lo-fi: The Basement Tapes of Sigrdur Níelsdóttir, a Danish-Icelandic co-production directed by Kristín Björk, Orri Jonsson, and Ingibjorg Birgisdóttir, themselves participants in the Icelandic music and art scenes. I had heard (and watching this film will hopefully verify or disprove) that members of that amazing ensemble Sigur Rós helped 'discover' the hidden musical gems that Níelsdóttir was creating merely for her family and friends. And as has been said by many about this less populated island situated where the North Atlantic and Arctic Oceans pour into each other, most everyone in Iceland knows each other, and by extension, become 'family and friends'. That all said, a family obligation will actually keep me from hearing along with seeing on screen what the 70 year-old began recording on cassette tape in geographical and subculture isolation. But what I have had the opportunity to see from this year's SF DocFest is Director Hugh Hartford's equally elder-ed Ping Pong. (This documentary also contains its own bit of pleasant music in the closing credits where the ping-pong-ing of a ball on table tennis table and raqcuet, what I've learned the British players call a 'bat', provides the beat). 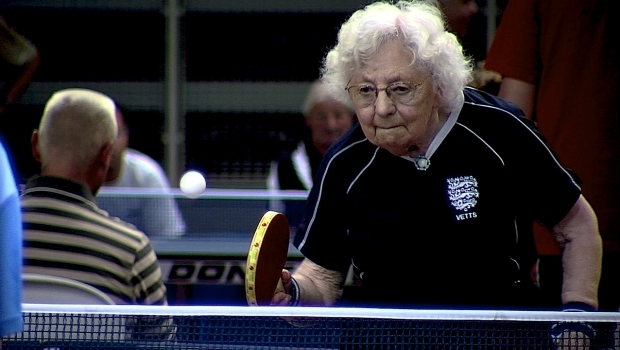 Ping Pong follows eight over 80-years-old players competing in the Senior World Table Tennis Championships. Two from England, two from Germany, one from Sweden, one avid smoker from China, one Austrian immigrant from the United States, and one 100 year-old sensation from Australia. I've recently found myself appreciating the sport of table tennis while in Japan during the London 2012 Olympics. The only Japanese athlete representing my wife's hometown of Yamaguchi City, Kazumi Ishikawa, came in that bitter-tasting fourth place individually but ended with a Silver medal for the woman's team event. The moment when they secured at least the silver by beating Singapore in the semi-finals was something we got to watch over and over again because Japanese television constantly re-played that match. I still feel the teary joy sparked via my mirror neurons when looking at images of Kazumi and her teammate's crying after securing their place in the final gold medal match. The joy was not a chance to win gold. They were merely happy to finally get a medal for Japan in the event, guaranteed a silver. Everyone knew Japan wouldn't win the gold medal match because, well, the Chinese always win.
. . . Except on the senior circuit, as we learn from Ping Pong. Ping Pong is not a typical sports documentary designed to have you revel in exquisite athleticism. No one has 'impressive' kinesthetic skills here. You are merely happy some of these athletes can keep up with the demanding pace, let alone simple keep themselves standing up in the first place. As a result of not being able to show dynamic play, Hartford includes some nice diversions from the typical sports doc set-ups. For example, not much is shown of the final matches. More attention is paid towards the lives of the athletes and the demographic stage of life in which each athlete is an age cohort. Englishman Terry, the youngest of the bunch, is battling through life-threatening illnesses. German Inge is able to play through her dementia while her compatriot Ursuhla hopes to die on the table tennis table. Then there's Les, the Charles Atlas of senior table tennis, who looks like he'll go on for another 80 years at this rate. Ping Pong treats its subjects with respect, letting them tell their own stories, allowing the humor and sympathy to come from them rather than imposing either upon them through editing. A core message is what such an activity can allow for us in our elder years. A senior circuit like that shown in this documentary provides regular exercise for the elderly, plus such competition provides the mental benefits of a focused challenge that offers the side benefit of enabling one to focus away from the pains and limited abilities of old age. And most important, it provides a community of folks who refuse to bowl alone, to adjust a Robert D. Putnam phrase, since it takes two to table tennis.